For a lot of us in Winchester, Waterloo Station is the building we see most days on the daily commute. We eventually see it in some cases as we all know – simply because there just aren’t enough lines into the station, or platforms to accommodate the trains. How often have we crawled the last few miles between Clapham Junction and London Waterloo and been given that as an excuse over the PA system? The deal is hoped to be able to provide a 30% increase in peak time passenger capacity by 2019. London Waterloo is Britain’s busiest railway station and the main station for one of the busiest railways in the country. The number of passenger journeys has more than doubled in the last 20 years to 234 million per year, and further growth of 40% by 2043 is forecast. Investment is also being made in a fleet of 150 new train carriages to create extra capacity for South West Trains passengers. 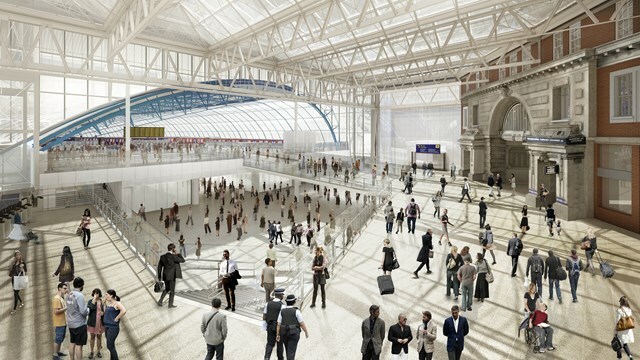 The intention is to rebuild the former Waterloo International Terminal, allowing platforms 20-24 to be brought back into use with modern facilities, new track and signalling and a layout suitable for thousands of domestic passengers. They will also create a spacious, modern and accessible station concourse near platforms 20-24. Sir Peter Hendy is Chairman of Network Rail and has also welcomed the improvements: “Let’s face it, this is not before time. Since 1996, the numbers of passengers on routes into Waterloo have more than doubled – rising from 108 million passenger journeys a year to over 230 million. And this increase is showing no sign of slowing down. Tim Shoveller is Managing Director of Stagecoach Rail: “We are proud to run one of the country’s busiest railways – providing half a million journeys every day – helping to support businesses, communities, families and friends travel across the south west of England.